There shouldn’t be a Citrus County. Teenage romance should be difficult, but not this difficult. Boys like Toby should cause trouble but not this much. The moon should glow gently over children safe in their beds. Uncles in their rockers should be kind. Teachers should guide and inspire. Manatees should laze and palm trees sway and snakes keep to their shady spots under the azalea thickets. The air shouldn’t smell like a swamp. The stars should twinkle. Shelby should be her own hero, the first hero of Citrus County. She should rescue her sister from underground, rescue Toby from his life. Her destiny should be a hero’s destiny. With Citrus County John Brandon joins the ranks of writers like Denis Johnson, Joy Williams, Mary Robison and Tom Drury, writers whose wild flights feel more likely than a heap of what we’ve come to expect from literature, by calmly reminding us that the world is far more startling than most fiction is. He subverts the expectations of an adolescent novel by staying true to the wild incongruities of adolescence, and subverts the expectations of a crime novel by giving us people who are more than criminals and victims. The result is a great story in great prose, a story that keeps you turning pages even as you want to slow to savor them, full of characters who are real because they are so unlikely." "I finished the novel a true believer: that Citrus County is gorgeous and deserves to be read widely; and that John Brandon is a great young writer who canand probably willdo just about anything." "[Brandon] focuses not on the charms of manatees and meandering rivers but on decaying strip malls, abandoned subdivisions and the claustrophobic side of small-town life. He gives us a vividly realistic picture of a place teeming with swamps, sinkholes and insects, "creatures with stingers and pincers and scorn in their hearts" and a human population with much the same attitude. Brandon draws his characters so deftly that we can be horrified and intrigued by them at once, and his plot just as deftly avoids cliches." "If you care at all about books, and what they can do, then this dirty realism is for you. There are very few writers who are as adept at stripping a sentence down to its very essence; nor are there many whose sentences leave a reader so black and blue." "[A] chilling and dispiriting new novel... this book is impossible to put down." "Citrus County luxuriates in the blighted majesty of rural America. The narrative is bracing, concerning teenage lovers who find themselves in a true-crime caper gone awry. What makes [Brandon] unique is his empathy toward the community at large. He is concerned not only with the key players, but also with the people affected by their actions, those characters usually ignored like the collateral damage many authors consider them to be. What results is a novel suffused with musky swamp air, teenage love, and mosquito bites." "[Citrus County is] not an easy book. One doesn't want to imagine that cold-blooded quasi-sociopaths are on the local eighth grade track team. But Brandon's unflinching look at the devastated inner life of his characters is so unerring that it's hard to look away. Exactly as they planned, by unleashing their most macabre impulses these characters become more vibrant, impossible to ignore." "John Brandon's macabre novel Citrus County is at once touching, funny, and terrifying. Definitely an odd (and extremely rare) combination, but Brandon is a master at creating greatly flawed, believable characters who jump off the page and into our memories. Brandon's debut novel Arkansas greatly impressed me and landed on my favorite novels of 2008 list. 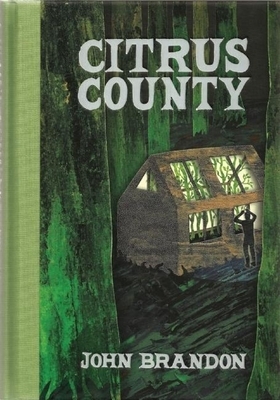 Citrus County is a worthy successor, a book that haunts as well as it entertains." "Last night I stayed up late because I had to finish John Brandon's upcoming novel Citrus County. And when I say I had to finish, I mean I was compelled! Gripped! Creeped out! I was nervous about what might happen to the various characters in their various states of peril! John Brandon is a wonderful writer in a literary way but not MERELY. I mean, there's real suspense. Sometimes writers get all beautiful on you and forget to remind you to turn the pages. Not John Brandon! He does it all."